Rafa Benitez begun his Real Madrid tenure is disappointing fashion as Los Blancos were held to a goalless draw at La Liga newcomers Sporting Gijon. The Whites had plenty of possession throughout the game but failed to make their dominance felt as their attacking unit remained strangely out of sorts. The home side indeed could have had all three points on another day, with Antonio Sanabria hitting the bar with a header 10 minutes before the interval. 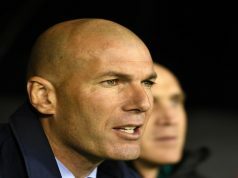 There was a new look to the Real line up for the opening fixture, with Benitez opting for a 4-2-3-1 system instead of Carlo Ancelotti’s 4-3-3 preference. Jese Rodriguez started up front in the absence of Karim Benzema, with Isco, Gareth Bale and Cristiano Ronaldo deployed behind him. The visitors began the game the strongest and had plenty of chances to open the scoring. Jese just failed to make contact with a Ronaldo cross while Bale could only find the side netting after rounding goalkeeper Pichu Cuellar. Isco also went close with a dipping long range effort. But Sporting gradually grew in confidence and while they managed to nullify the Real attack, they carved out a few openings of their own. In the second period, Benitez introduced James Rodirguez but he would have little impact on the game. 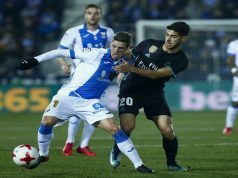 New signing Mateo Kovacic made an appearance for 20 minutes and showed in glimpses that he has the potential to be a good player in the side. But overall it was a frustrating night and a poor start for Real and Benitez has plenty of thinking to do about where the goals will come from. It is really a poor and disappointing start for the team. This result shows the amount of work to be perform in the team. I urge the coach to favor the collective, the teamwork aspect at the front line. We the fans, we don’t want to know who scores, all we want to see is the team is winning. There was more than 4 occasions where the player carrying the ball should have passed the ball instead of looking to score himself. Look at the 3 front players of Barcelona, they feed each other in goal. There is too much individualism in Real M. frontline. There is no creativity, no smart movement of the attack in the front to find a clear chance to score. It is inadmissible to control the game the way Real Madrid did, and not being able to score a single goal. I have been a fan for 20 years! This is not the Real madrid that i fell in love with!! Your killing the club with your poor performance! You All discuss salary and contracts All the time! Maybe you should try something New! ? 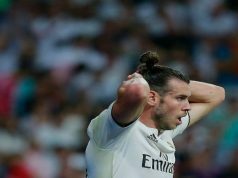 I thought Real Madrid the Better Team and Sad they didn’t Score Hats off To Roving Bale He was Trying hard all over the Place as was Ronaldo would have put two away easy Just wasn’t to be on The Day I think we will see Plenty of Goals This season as Progress and intensity increase on the Field. Maybe sit the Players down and Re watch this Performance I agree with other comments Every body wants to Score Goals and Try too hard sometimes instead of Passing for the Team Win they go it alone this can be so counter productive for Main Strikers who are expected to score Goals Chances For Real were Created sadly 0-0 with Sure 100% Ronaldo Penalty on the replay. Hala Madrid Early Days!